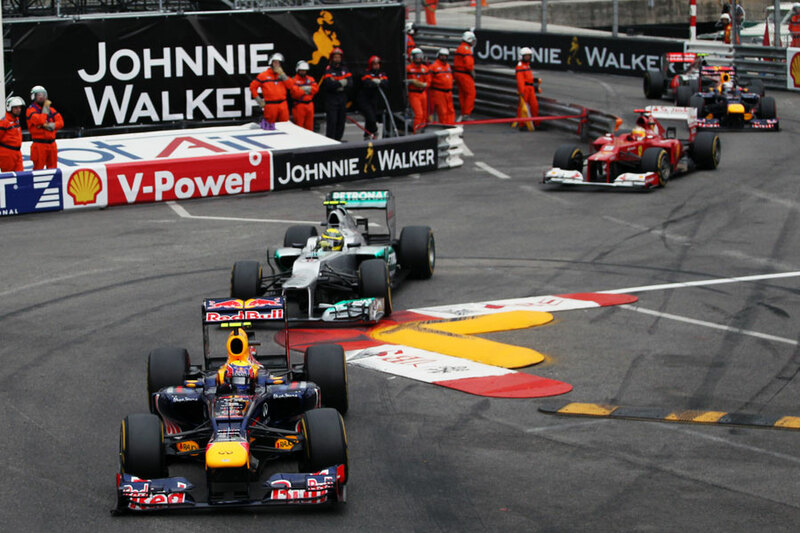 While it wasn’t the most entertaining race, the fact that it was the closest ever top-four finish at Monaco meant it was a tight one throughout. You’re always looking for shots that will capture the essence of the race, and I think that’s what this one does. Having the leading five cars all in a row and in one shot together so late in a race is very rare, but you can also see just how tight the track is. There’s no way past, but the barriers are so close you know that one mistake will end the race for somebody, and Webber was under a great deal of pressure too. 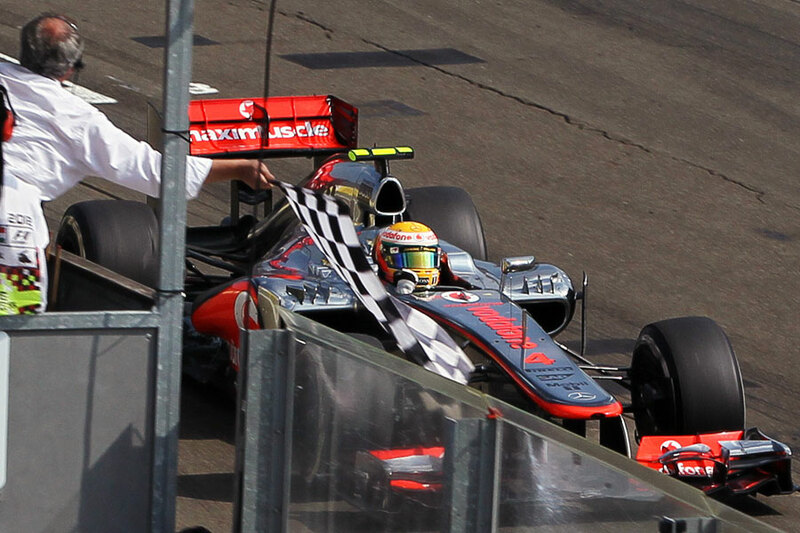 Look how close the marshals are to the cars too – you don’t get that anywhere else. It really is such a unique race. 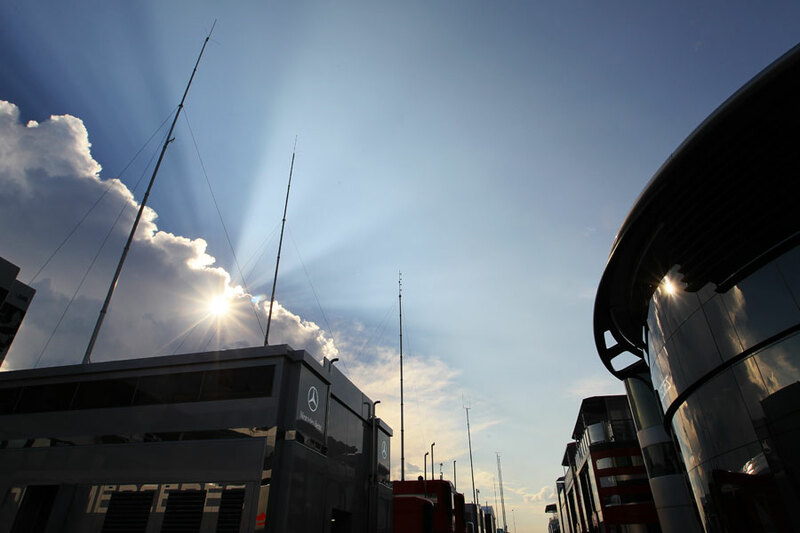 Keith Sutton: At the time this was shot most photographers were in the wire room uploading pictures, but it was such a lovely evening that I decided to take a walk over to McLaren’s hospitality. All of Lewis’s entourage were milling around, including his girlfriend Nicole Scherzinger and manager Simon Fuller, and I was just grabbing shots of that because the light was so nice. Then I saw Lewis head out of the paddock so I thought I’d follow him because it’s always nice getting photos of the drivers crossing the pontoon when the light is low. So while he was signing autographs I went ahead and strolled to the end of the pontoon to get a picture of him with my 70-200mm lens. Then as he came towards me he pushed his trainer, Antti Vierula, into the Olympic rowing basin! 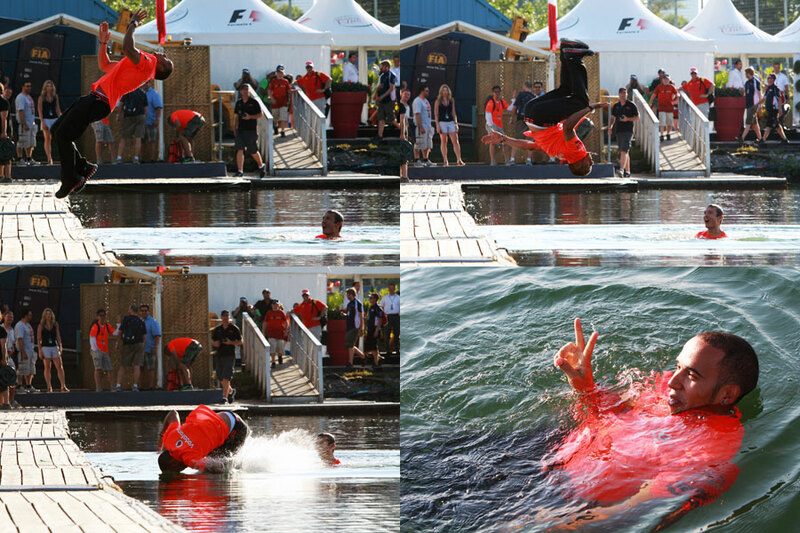 But what I wasn’t expecting was what happened next as Lewis put his back to the water and did this incredible backflip! I just kept my finger down and the autofocus did its work to capture this incredible sequence of him jumping in. 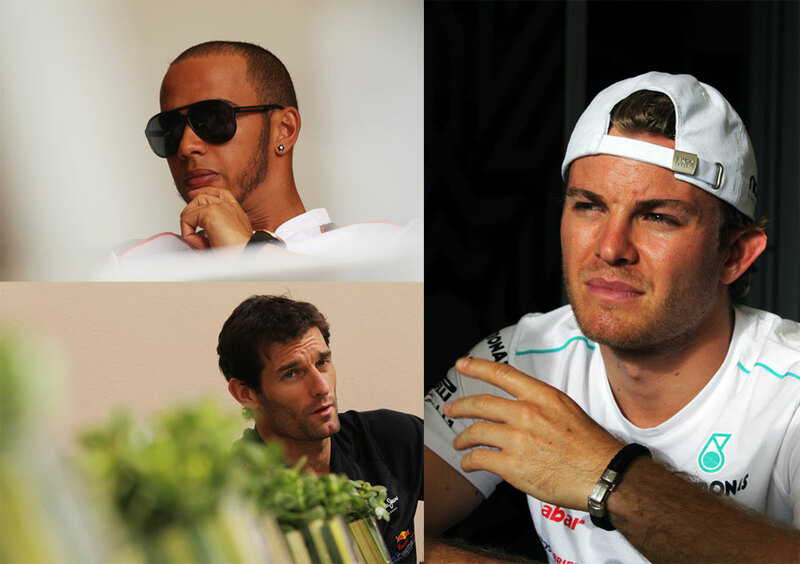 My thoughts were, with Hamilton being a McLaren driver, he doesn’t get a chance to do what the Red Bull drivers do in the swimming pool when they win in Monaco. So I said that to him as I thanked him for the photos. It was a great end to a great weekend. Sebastian Vettel’s Red Bull stopped on the track on the Sunday and they didn’t quite manage to get it back to the pits. It got halfway between the first corner and the pits so I was able to get a few shots of it by itself and I was able to go a little bit closer than normal. It’s nice to be able to have a bit of freedom to take photos of the car and not have mechanics trying to shove you away and guard it. 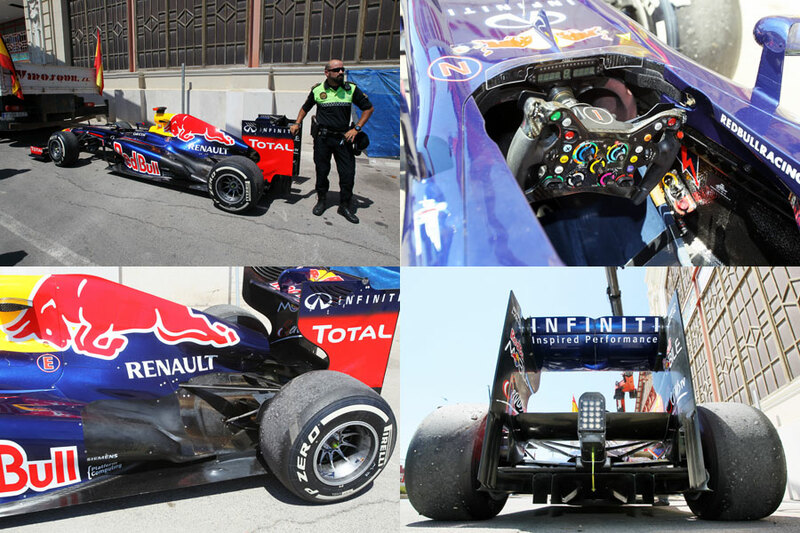 So to get a close up of the steering wheel and the rear of the car is a little bit unusual. It’s almost pitch black behind Alonso in qualifying. It was his final run in qualifying and this shot has not been edited at all. I’ve darkened the car slightly but have not touched up the clouds or anything. It’s actually sunny at this point of the session as the track dries out and Alonso is coming down into Vale on the inside of the track. With the sun being out and the black cloud in the background it creates a really nice picture, a kind of moody, menacing image. It was just good to be in the right place with the incoming weather behind to create this moody shot. I think Santander missed a trick in this photo. Around the chequered flag they had their advertising but it didn’t stretch down to the team. Apart from the flag post, the team is where most people are going to shoot and Santander is missing from the wall. It suits me because I like nice clean backgrounds and the red works well with the car and the team. 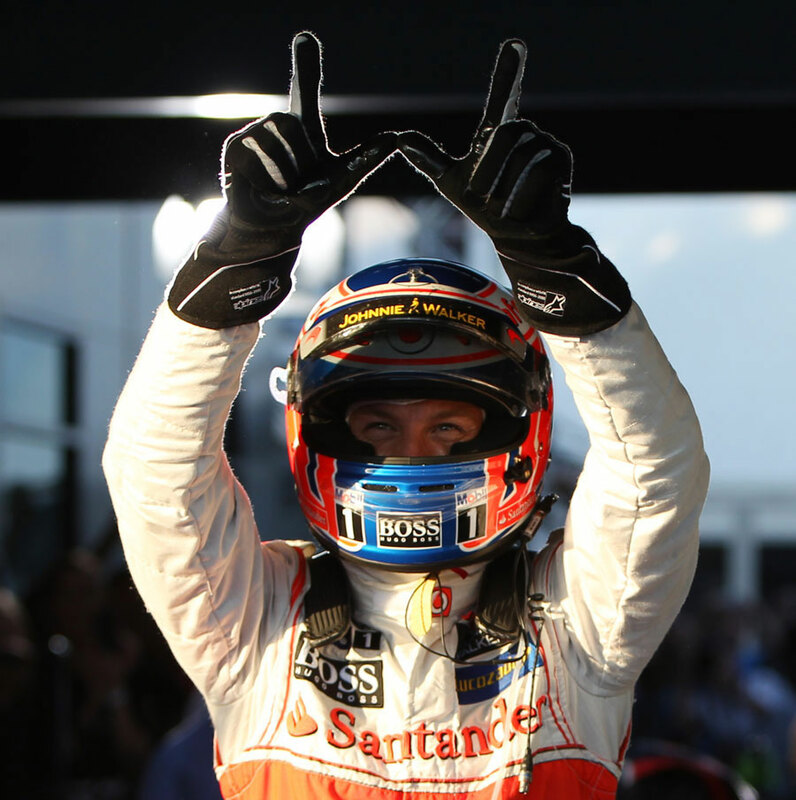 Alonso has one hand in the air – I would have liked to have two, but I guess I’m just being critical now – so it really does create a great image. 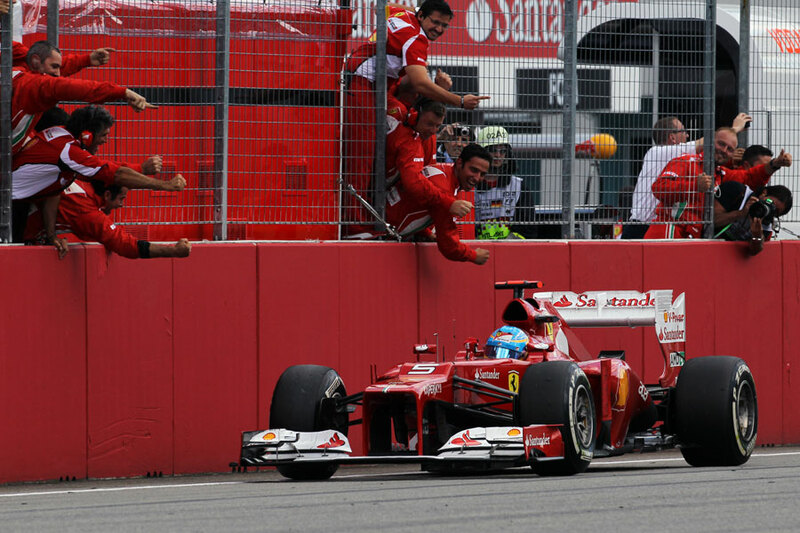 Alonso is absolutely on fire at the moment and the team love him and have really warmed to him this season. The car doesn’t really look that trick, but they just get their work done each weekend, bring little updates and at the moment it’s all working for them. It’s amazing how he was able to defend from Jenson Button, even in the DRS zone, so he’s clearly comfortable with the car. After doing the parc ferme shot when Lewis was saluting his team, we managed to get his attention and get him to look up. We were just shouting and there were three times he looked up at us, which is good. It creates a great shot because he’s looking right at us as he sprays the champagne. I was just swapping between lenses for different shots but it was quite tight; you never actually see where we shoot from but there was five of us up there and the space for five was not good! It was restricted but I pulled a fast one and didn’t tell anyone I was going up there. I managed to sort it out just before the race and it turned out to be worth it. It’s all about getting the best pictures at the end of the day and getting something unusual – something from a different angle that nobody else has got – and hopefully that convinces the editors to use the pictures more because they’ve got something completely different. The light was just incredible when Jenson got out the car. He came over towards me and I was quite low down so there’s a bit of sky behind it and you can see his gloves. The problem for people who were higher up was that the black background made it hard to distinguish the gloves, which are making a “W”. He was obviously ecstatic and the best thing about it was that I won some money on him so it was even better! I was doing an autograph signing session with him at the last test in Barcelona and the last thing he said to me was “see you in parc ferme” so I took his word for it and put bets on for pole, victory and to win the championship. I was quite happy with that! I like this top shot of the mechanic’s finger, but it’s actually a mistake! It just shows you how autofocus works sometimes. When you don’t use manual focus and you use autofocus sometimes it can pin in on something that’s in the foreground. I think it creates a really nice picture, personally, because it’s just the one finger up like he’s the man, but it wasn’t what I intended! 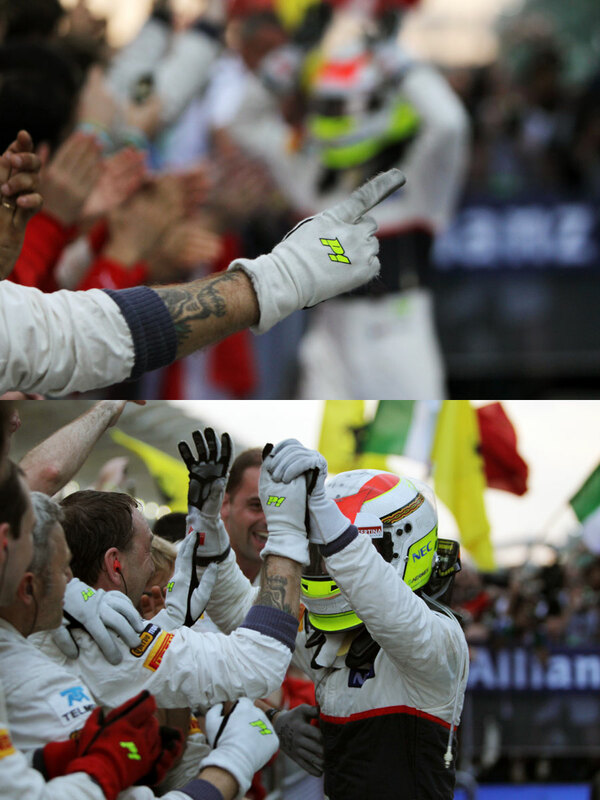 It just shows emotion too, you’ve got him in the background out of focus as he greets all his mechanics. Here I’d gone for a really weird position, just down the line in parc ferme. I saw all the mechanics and knew he’d come over – I just took that instinct into it and thought he might come over; he’s more than likely to. So I just leant out a bit and shot down the line. Great emotions though, as you can see with the sharper picture below where he’s celebrating with the team. 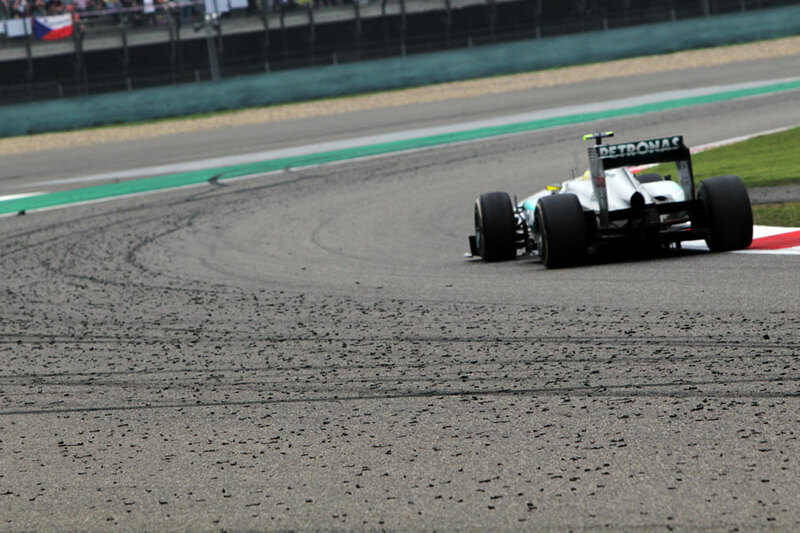 This just shows you how bad the marbles were in China, and tyres played such a crucial role in the race. I was trying to get an angle somewhere around the track that showed all the debris because it was horrendous. 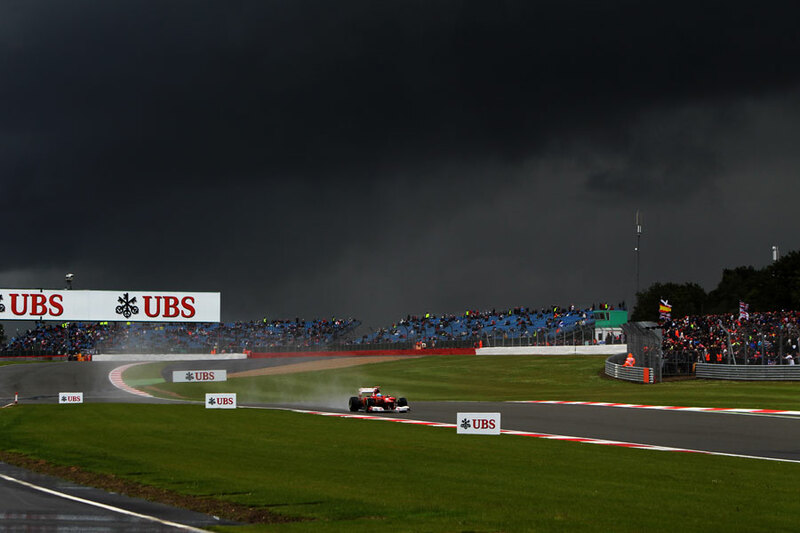 When a car went off-line … well Raikkonen showed how bad it was when he lost all those positions. He lost five places in one lap, and if you go off line you’re in real trouble. It was all about finding the spot, and as I was wandering back for the finish shots I could see it there. I shot a couple through the fence at first, and then there was a marshal’s post, so I just thought ‘well that works really, really well’. Here’s proof that Mugello is an old-school circuit. In this photo you can see the perimeter wall of the circuit, but unlike other tracks the catch-fencing to protect the spectators is further back with the perimeter road in between. So as a photographer you can shoot from behind the wall but in front of the fence rather than through holes in the fence as we have to do at most modern circuits. In this shot you can see that Sebastian Vettel has cycled over from the pit lane and has an unobstructed view of the car. Williams had done the celebration picture and they all started mobbing Frank so I thought I’d head up to the media room to wire the pictures. 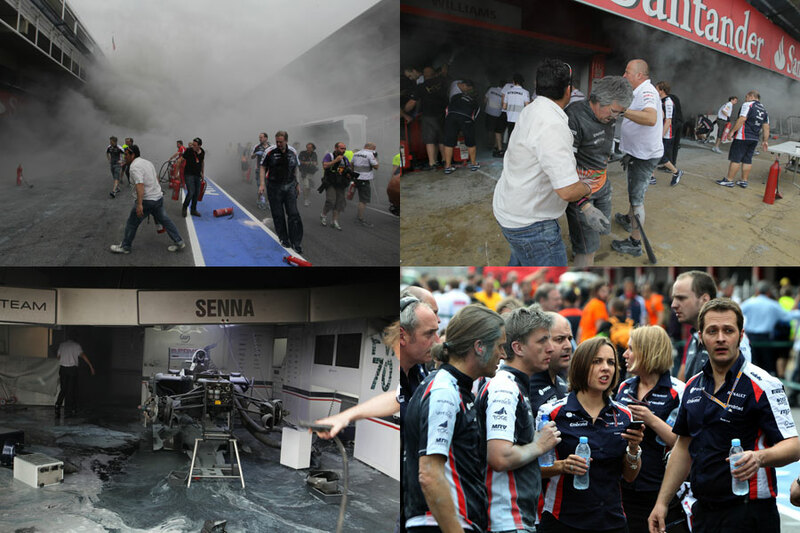 As I was heading back I could hear this explosion and everybody looked up at the smoke so I ran back through it all to see people pulling all the fire extinguishers down the pit lane. It was absolute bloody chaos, but what was amazing about the fire was the camaraderie and all the support that the teams gave. Everyone brought fire extinguishers, they knew it was a fire and they knew it could affect other garages if they just left it, so they all showed their support. It was great. It was a bit like a warzone trying to shoot it all – I felt like a war photographer – I didn’t want to get in people’s way but my news head kicked in and I felt like I needed to get the shots. I didn’t do too badly, it was incredible seeing some senior team members mucking in and quite a few were covered in extinguisher dust by the time they stepped away. It was just a weird moment in the evening on Friday. It had been raining for a lot of the day but then it cleared but this cloud held there for ages. The sun was quite dramatic just when it was even behind the clouds but then it peered through this little gap and created this halo effect around it; it was really weird. It felt a bit like Independence Day when a spacecraft is about to come through the cloud! It was weird to see in the paddock, and here it’s over the McLaren and Mercedes motorhomes. It was pretty apt that it was above McLaren as it’s emerging from its own dodgy spell, but this was a case of keeping your eyes open for any opportunity around the circuit at all times of the day. I shot Kimi here from the pit lane exit, as the pit lane dips over a brow as the cars come out. It’s a good spot as what often happens is the cars come out and pull over to the side and perform practice starts and burnouts. You’ve got this sort of shimmering light above the track as they come down, and what I’ve done here is moved the focus point to the top and motor-driven it as Kimi’s come down the pit lane. Sometimes you just look for something different when you’re shooting. I’ve managed to create a backlit effect here so that the light is glistening off the car with the heat haze surrounding it. This was on Saturday morning and with the weather so good we had a good crowd down at the last corner which forms the background as well. I don’t know why Sebastian is doing this because he looks a bit stupid! I can understand when the drivers are getting ready and aren’t going out then they put their earplugs in but never the balaclava on half of their head. 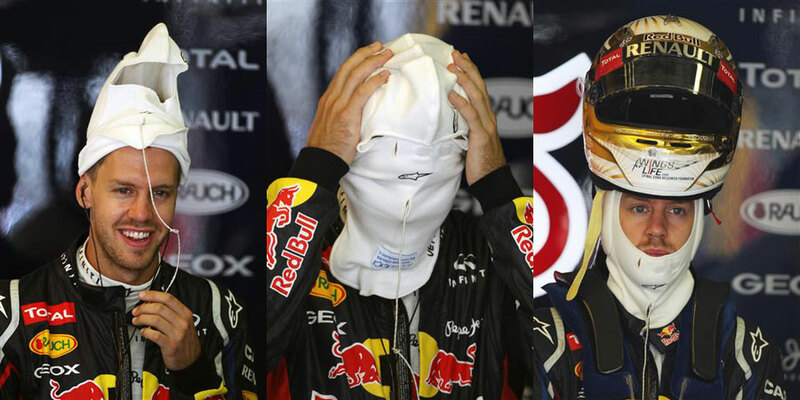 I think drivers are normally quite conscious about their look, but Vettel walks around with his helmet on his head! He walked right to the front of the garage and just stood there with it on his head like that, I suppose what he then does is just push it down when he’s ready to get in the car. There’s no real point to it though, as the ear plugs are separate to the helmet so it’s not like he’s receiving communication through his helmet. I remember when Jean Alesi through his helmet in to the crowd after he won the race in Montreal and Ferrari went to get the communications piece back because they thought it was worth more than the helmet! But I just thought this was funny; Seb looks a bit like a smurf with the balaclava as a hat, or Spiderman when it’s over his face! I actually shot this from a roof above the podium. I’d seen this roof over the weekend and I wanted to get up there for the podium ceremony, so I managed to wangle my way up. I wasn’t sure what sort of shot of the finish I’d get from there as Kimi was still quite close behind and I wondered if Lewis would just drive for the line before celebrating. But he decided to pull over immediately out of the last corner and that’s created quite a nice shot because you’ve got the flag in almost the perfect position; it’s not blocked his helmet. The only thing that I’m critical about is the panels in shot – I know they need to be there to prevent debris flying over the pit wall if there’s an accident but it’s not ideal in this shot. But that’s just me looking at how it could be better. It was pot luck really that I got the shot in the first place as I’d only gone up there to capture parc ferme and the podium. After doing the parc ferme shot when Lewis was saluting his team, and then we managed to get his attention after the podium ceremony. We were just shouting and there were three times he looked up at us, which is good. It creates a great shot because he’s looking right at us as he sprays the champagne. I was just swapping between lenses for different shots but it was quite tight; you never actually see where we shoot from but there was five of us up there and the space for five was not good! It was restricted but I pulled a fast one and didn’t tell anyone I was going up there. I managed to sort it out just before the race and it turned out to be worth it. Because we have four people there then it’s worth me having a go; if I don’t get it then I don’t get it, but if I do then I’ll give it a go and I try to get as much as I can out of the picture. It’s all about getting the best pictures at the end of the day and getting something unusual – something from a different angle that nobody else has got – and hopefully that convinces the editors to use the pictures more because they’ve got something completely different. 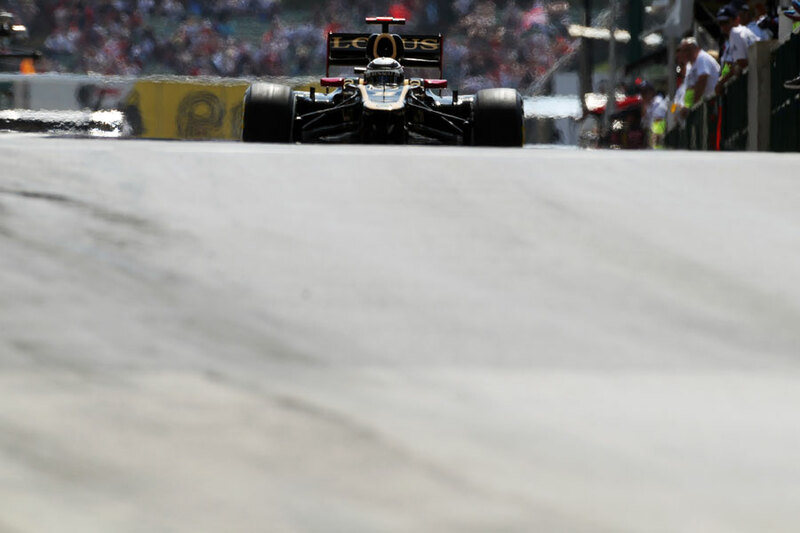 I think everyone loves Budapest; it’s not an expensive place to go, the people are very friendly, it’s a beautiful city, the track’s quite close, there’s not a lot bad to say about it really even if it doesn’t create great racing. I’m not sure what nationality this fan is – I got the impression he’s British but he could be Finnish for all I know! 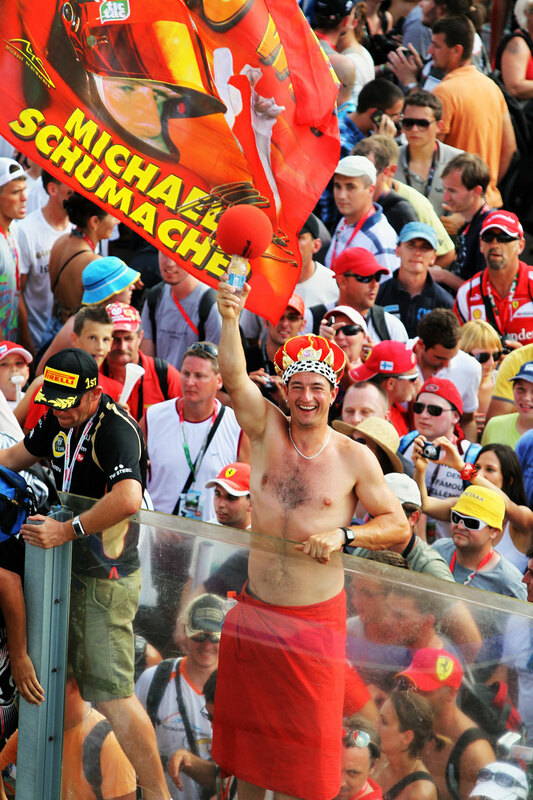 – and he was parading around after the podium had finished. There’s quite a relaxed mentality from security at the circuit and the fans were allowed to climb up there as long as they don’t try and get in to the pit lane. It’s a great atmosphere; there’s a lot of Finns, Swedes, a real mixture of people. There’s no Hungarian driver in Formula One anymore but the crowd were still getting behind Pal Kiss who was driving in GP3 – the only Hungarian in a support race. We shoot the support races and there was some great action, especially in the GP3 race on Sunday morning which was run on a drying track, which Pal Kiss finished third in before getting a penalty. We back Kevin Ceccon in that series and he too was having a good race before a poor pit stop, but it was still great entertainment for the fans.